In the fall of 2017, Cheq Bay Renewables worked with area farms to assist them in installing solar photovoltaic (PV) on their premises. There are various financial incentives that businesses can use depending on their utility and business type. 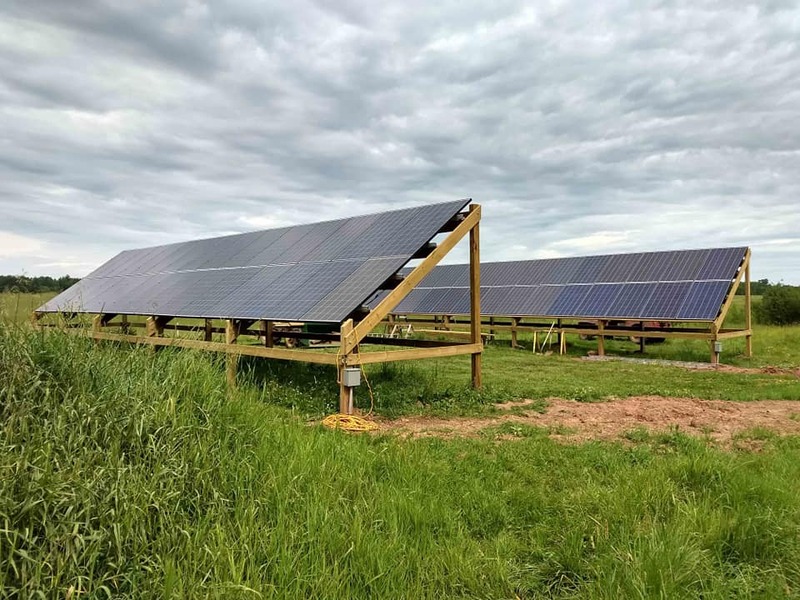 Three farms where customers of Xcel Energy so were eligible to apply for Wisconsin’s Focus on Energy Renewable Energy Competitive Incentive Program (RECIP). The RECIP grant is a partnership between the State of Wisconsin and its public utilities. The fourth farm was a member of Bayfield Electric Cooperative which does not participate in the Focus on Energy programs. That farm, however, applied for and received a USDA Rural Energy of America Program (REAP) grant. The REAP program is designed to assist rural businesses and will pay up to 25% of a project’s cost. 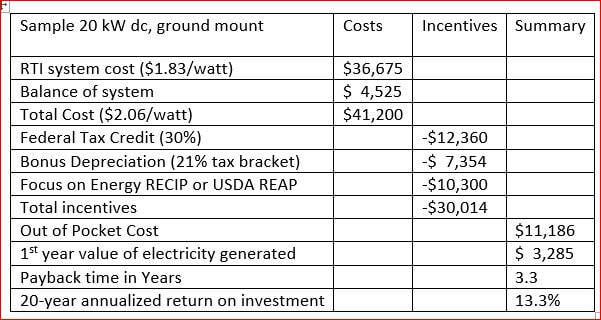 The 30% Federal renewable energy tax credit and bonus depreciation are additional incentives that the farms used to enhance the projects economics. All the systems were grid-tied so the net metering policies of both utilities were additional utility-based incentives. 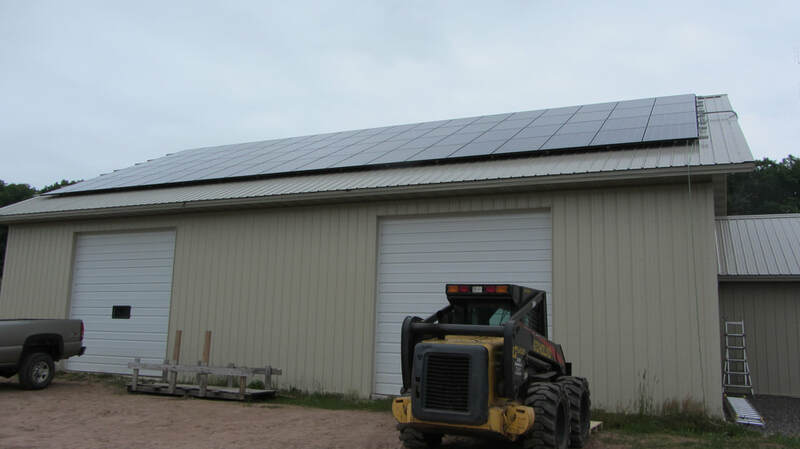 The resourceful farms also installed Ready-to-Install (RTI) systems, the brainchild of Next Energy Solution (NES), headquartered in Shell Lake, WI. An RTI, just like the name suggests, is a set of parts, blueprints and instructions so the owner can self-install the system, saving on labor costs. A licensed electrician makes the final connections and NES oversees the project, inspects, and handles the interconnection with the utility company. The first farm to come online with their new 21.6kW dc (20kW ac) PV system was Highland Valley Farm located just outside Bayfield. 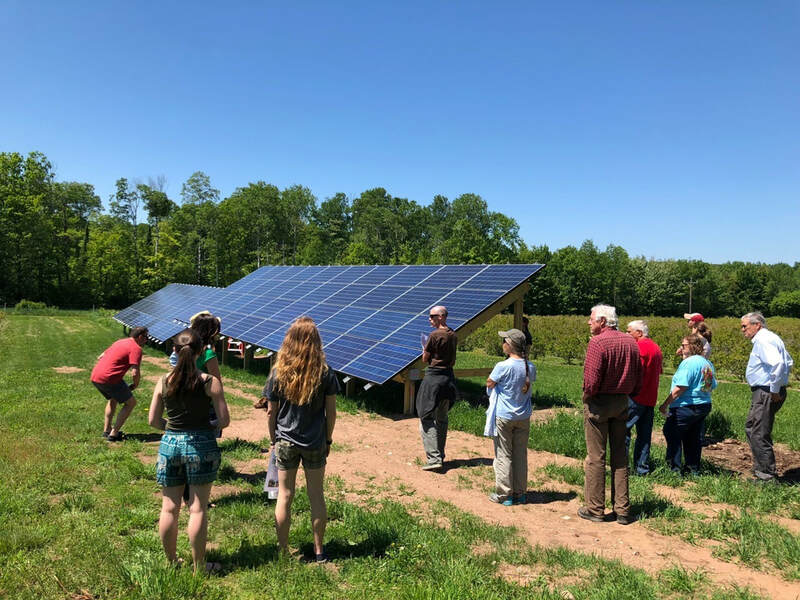 Commissioned in June of 2018, Highland Valley is now the largest privately-owned PV system on Bayfield Electric Cooperative’s system. The PV array is a fixed ground-mount installation and should offset 100% of their electrical needs on an annual basis. Hauser’s Superior View Farm, also just outside of Bayfield, installed a 19.4kW solar PV system. The new rooftop solar array is located on their commercial greenhouse support building, supplying needed electricity to 9000 sq. ft. of greenhouse space and surrounding buildings. The project was completed in August 2018. Griggs Cattle Company, just south of Ashland, installed a 16.2kW array which was also completed in August 2018. It, like Highland Valley’s, is a fixed ground-mount installation. Griggs was able to finance the project through local investors, another benefit initiated by Cheq Bay Renewables. Below is an exemplary table showing the economics of the mentioned projects. Each project is unique in size and cost, but the table demonstrates the benefits of the various incentives and the approximate average payback and return on investment.